Clare Connolly, a volunteer at Stockport, has investigated Stockport and its military hospitals in the Great War, through the personal story of Phyllis Nield, a Voluntary Aid Detachment nurse. This was the County/Branch badge belonging to Phyllis Nield who volunteered with the Red Cross in Stockport to care for wounded soldiers during World War I. 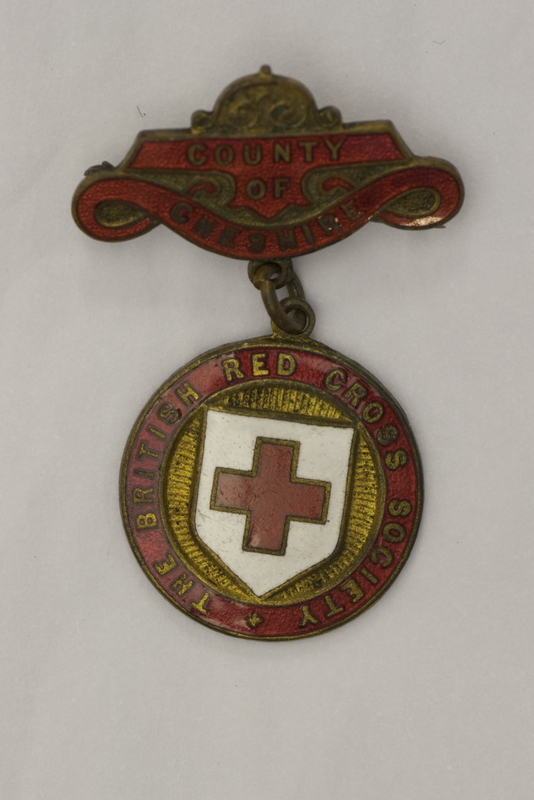 These badges were awarded to officers and members of branches of the British Red Cross and its voluntary aid detachment. In 1909 the War Office issued the Scheme for the Organisation of Voluntary Aid. The British Red Cross and the Order of St. John combined to form the Joint War Committee (JWC) and provide additional support to the Territorial Forces Medical Service in the event of conflict. For this purpose the county branches of the Red Cross organised units known as voluntary aid detachments (VAD). Both men and women were recruited and while the male detachments trained in first aid only, the women were also required to train and pass examinations in nursing. The term VAD was used to describe all personnel serving in the system but was particularly associated with the nurses. By the outbreak of World War I there were approximately 50,000 women volunteering as VADs. The Joint War Committee administered both auxiliary hospitals and convalescent homes and a large amount of the work of the VADs involved caring for wounded soldiers in these institutions. Private homes were in some cases converted into temporary military hospitals including large houses and stately homes. VADs wore Red Cross armbands and were encouraged to carry their identity cards to show they were Red Cross workers, therefore giving them the protection of the Red Cross in case of invasion. 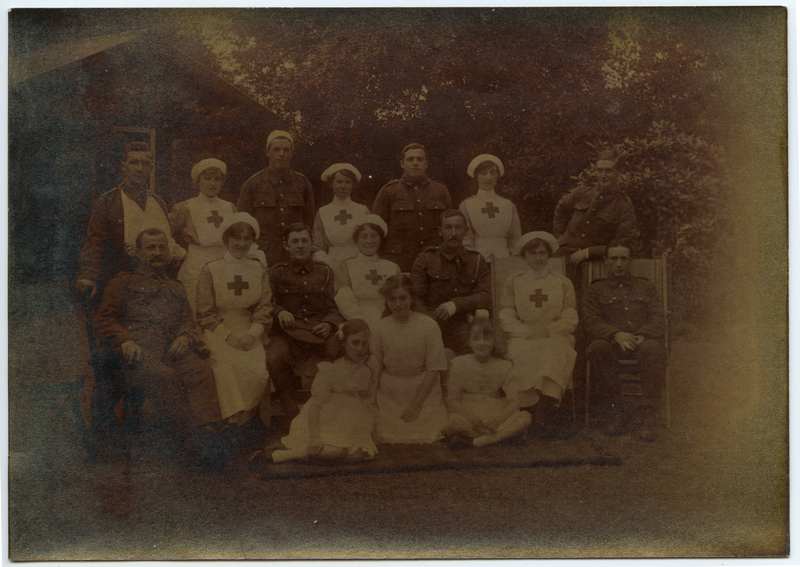 This is a photograph of Phyllis Nield taken with other nurses and soldiers in the garden of her family home ‘Inglewood’ in Davenport Park, Stockport. The soldiers had been invited by her father Robert H. Nield, a local businessman who was a piano merchant in Stockport. He owned Nield and Hardy’s music shop of St Petersgate, Stockport, which later moved to Underbank. Phyllis Nield is on the middle row, second from the right. Her sister Marjory is on the back row, second from the left. This photograph includes Phyllis’s four sisters who lived with their parents Robert and Elizabeth at ‘Inglewood’. The census reveals that in 1911 Phyllis was 16, her older sister Marjory 17, Dorothy was 7 and twins Joyce and Winifred were 5. At the time the photograph was taken Phyllis would have probably been in her early twenties and her younger sisters are at the front of the group. The photographer was John Clarke Morten who Phyllis later married. In Stockport the VAD headquarters were located at Buckau House on Wyatt Street in Heaton Norris and the branch commandant was Miss Janet McClure of Norris Bank. St John’s Ambulance also assisted in the work of the VAD and their headquarters were based at Rechabite Hall in Higher Hillgate where the commandant was J.J. Orme. Lectures were given to VADs at the Technical School once a week and general practice was given at Buckau House. Stockport played an important part in the care of injured soldiers. By the end of the War at least twelve hospitals had been utilised or established for this purpose. There was a direct train service from London and soldiers arrived at both Stockport and Manchester stations. In his book ‘The Dark Cloud: Stockport Life in the Great War 1914-1919’ David Kelsall describes the military hospitals and their role in Stockport. Stockport Infirmary reserved a number of beds on the outbreak of the War and these were needed within a few days, soldiers being cared for both by regular nurses and VADs. By July 1916 48 beds had been reserved for the wounded. The injuries sustained in the Battle of the Somme, which ended in November 1916, led to the use of a new extension wing with 100 beds being set aside for the soldiers. A number of buildings were converted into military hospitals, for example, within three days of the declaration of war it was announced that Pendlebury Hall orphanage on Lancashire Hill was to be converted into a Red Cross Hospital. There was a public appeal from the Red Cross for items such as blankets, crockery and bed clothes and for help from those with First Aid Nursing certificates. In total 1811 men were cared for at this hospital. In March 1915 four local schools were converted into hospitals and these were the most recently built schools in Stockport with improved facilities: Alexandra Park, Hollywood Park, St George’s and Vernon Park. The children attending these schools had to move to other, now overcrowded, schools in the area. By the end of 1916 North Reddish Council School was in use as a military hospital and near the end of the War also Cale Green School. In November 1915 a second Red Cross hospital opened at the Wesleyan School in Heaton Mersey. In addition Stepping Hill Hospital reserved nine wards for the injured soldiers and by December 1915 it had 250 beds held for this purpose. Stockport had two shell shock hospitals by September 1918, both located in Brinnington, and this led to the establishment of the Stockport Special Shell Shock Hospital Fund. The Town Hall was eventually needed to house the injured soldiers and additional hospitals in the area supplied rest huts for the men. Phyllis Nield married John Clarke Morten in 1925. He served in the War and wrote a series of letters to his family in Davenport, Stockport which have since been published in the book ‘I Remain Your Son Jack’. He attended Stockport Grammar School and enlisted with the Manchester Regiment in 1914, serving with the 1st/7th (Territorial) Battalion. The first reference to Phyllis in his letters came in 1917 after a period of leave in Stockport and it is likely that their families knew each other. This may have been the period of time when the photograph at ‘Inglewood’ was taken. John Clarke Morten died in 1948 and Phyllis in 1986 after which time the letters were discovered.